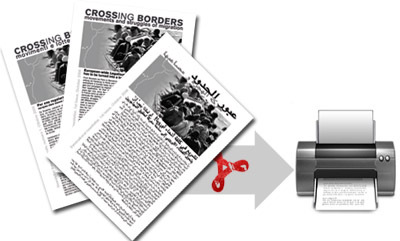 Once more we use the reference to a World Social Forum (WSF), which will take place end of March in Tunis, to publish a new number of Crossing Borders. To be a "Harraga" – a term used in North-Africa and translated as "burning the border" - is a daily issue in Tunisia, and the fate of the boatpeople, their disappearance and death, affects an innumerable number of families. Last year, in summer 2012, Boats4People was launched as a transnational symbolic campaign with protests and memorials in Italian and Tunisian cities to denounce the left-to-die policy of the EU-borderregime with thousands of victims. 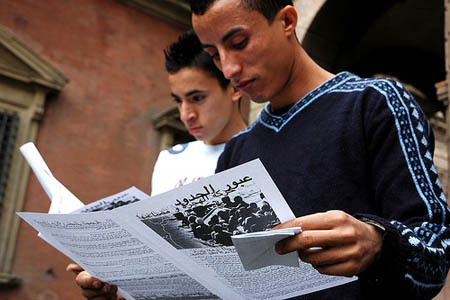 Against this background migration will become a main topic during the WSF in Tunis. Thus we start this issue of Crossing Border - as a kind of introductional text - with excerpts of a "diary between migration and precarity" - written after a tour through some tunesian cities in December 2012. 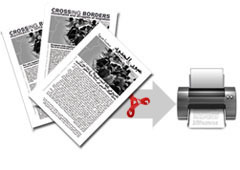 Support our newsletter, help to spread in both its electronic and printed version! Again we take the opportunity of a World Social Forum (WSF) in Africa to publish a new issue of Crossing Borders. We are even more convinced to do so as an ambitious project will take place in the weeks before. Demanding "freedom of movement and fair development" a bus caravan with about 200 activists from Africa and Europe start a common protest tour in Bamako in Mali, arriving in Dakar in Senegal for the beginning of the WSF (see page 2). Its not by coincident that you find a longer quotation of our 2nd issue in the opening text on migration and development – "on exit and voice“ - below. Exactly three years ago and with reference to the World Social Forum in Nairobi in January 2007 we published an open letter "to our sisters and brothers in Africa" on our frontpage. We still keep it as an important and valid document, signed by (not only) African migrants in Europe in order to to communicate their transnational approach and experiences to bridge and interconnect the struggles. Migrant struggles and solidarity campaigns are the main topics on the other pages too: the chain of actions 2010, mainly directed against Frontex (page 3); the europeanwide campaign against Dublin II, the project of a transeuropean webguide and the ongoing resistance in Italy (page 4). "No border lasts forever!" Thats the ambiguous title of a call recently published by the Network Welcome to Europe. The new call tries to interconnect the upcoming series of transnational mobilisations with a main common reference: the struggle against Frontex! Highlighting some main aspects of Frontex function and role in the borderregime the new multilingual issue of crossing borders intends to contribute and to inspire these next months mobilisations and struggles. “What crisis?” was the reaction of an activist from Mali, as he was recently asked to comment the economical crash, “we live in a permanent crisis!”. And of course he is right, looking at the situation in many countries of the global south. Nevertheless, the last 9 months affected in a particular way the living conditions of millions of migrants, not only in the European space. Migration and labour in times of crisis is like a thread that we follow to describe the material effects of the recession in different sectors, but also experiences of resistance or refusal. The socio-political organization of migrant labour remains the crucial question from our point of view. Subsequently we - as Frassanito-network - intend to organize a series of connected discussions and events in various European cities in late autumn ‘09. Our aim is to create more exchange and transnational communication about practices of self-organization and union campaigns in the field of migrant labour. Who is interested in participating and/or in the preparation of these events, pls. contact us: frassanito@kein.org And please help to spread the new newsletter, in both its electronic and printed version. We take the opportunities presented by two events, the European Social Forum in Malmö in September as well as the Euro-African Meeting on Migration in Paris in October, to publish another issue of the transnational newsletter Crossing Borders. Crossing borders#6 includes 8 pages: The first part summarizes the transnational chain of migration-related actions, providing brief reports from the stations that have taken place so far. The second part discusses some key aspects of current migration in 4 key countries: 2 texts focus on the situation in Germany and Italy, a thrid text takes a closer look at the situation in Mali and in the last article we take another look at the USA following up on the 'sleepy giant', that woke up in the immigrant protests of 2006. Crossing Borders! is an initiative of frassanito network that aims to foster migration-related networking and practical struggles. Previous issues have covered conﬂicts in western and eastern Europe, Africa and the USA. Here we speak about womenʼs migration, and not for the ﬁrst time: as we believe it is a crucial perspective to understand transnational movements and the organisation of labour (see issues 3 & 4). This issue of Crossing Borders! will be initially distributed at the opening initiative of the transnational chain of action – Fight the Mon- ster! Against Border Regime: Transnationalization now! (February- October 2008) – in Amsterdam, on February 2 (see page 4). support this newsletter project by contributing and distributing! The 1st of May gives "Crossing Borders!" another opportunity for transnational political communication. The theme of migrant labour was already central to the first two issues of "Crossing borders!" (see below), and it has become an important connecting point for the whole Frassanito Network. Remembering the huge migrants' mobilisations of the last year in the United States, as well as the struggles of migrants in Europe demanding the de-linking of residence permits from labour contracts, we want to discuss European policies for the management of migrant labour (page 1). Specifically, in this issue, we look at the conditions of migrant women as domestic workers and the key role they increasingly play in social reproduction (page 2). As usual, we report on some of the new experiences of struggle and communication emerging and consolidating everywhere (pages 3 and 4), signifying efforts in the autonomous organisation of migrant labour. It is not by chance that the 2nd issue of Crossing Borders appears at the same time as the World Social Forum takes place during January 07 in Nairobi. As it was in the last European Social Forum in Athens, we believe that migration must be recognized as an own thematic axis. Nairobi is another opportunity to continue not only the european- african political communication (see page 2 of the newsletter), but also to shift the migration related networking process to a global level. To foster transnational communication was and remains the aim of "Crossing borders". The first issue (available in 10 languages below) was published on the 7th of October, the transnational day of action (see page 3/4). It was distributed during the respective demonstrations, and the initial response on our newsletter was good. To accompany transnational mobilisations will continue to be our aim. Further issues will come for an europeanwide legalisation-campaign (see page 2), for the next 1st of May and migrant-workers activities, or for the coming Anti-G8-campaign in Germany in June 07. But why do we emphasize transnationality? Movements and struggles of migration are of course never national but also inter-nationality cannot comprehend its importance. It is not a thing between states, rather a challenge to all concepts of borders and nation states, be it those of the governments but also for example those of the main unions. Migrants move for a better live and against the hierarchies of exploitation. Migrations undermine the border regimes and create networks and communities beyond all nation states, from countries of origin through transit- to the target-countries. To develop this transnational perspective of global social rights we need transnational communication. Crossing Borders want to offer a possible tool for it and we hope, that more and more people participate with contributins and distributions! "Crossing Borders" is an attempt to foster transnational communication, our aim is to consolidate and to extend the migration related networking process in, around and beyond Europe. We do not ignore the differences in realities and struggles in various regions, countries or continents. But we are convinced in the necessity to bridge and communicate these differences - crossing these borders too!. We are committed to a process of "becoming common", not only by exchanging information and experiences, but much more by fighting against the same global apartheid- and migration regime! And by struggling for the common demands of freedom of movement and the right to stay! This newsletter will focus to the movements and struggles of migration, taking into account their multiplicity. In each issue we will present manifold protests and campaigns, social and political struggles from different local situations. That’s one reason, why we ask all of you to contribute to this project and to provide - at least in a few sentences – your experiences. But wider participation is crucial for this newsletter on more levels. We follow a multilingual approach and so we need continuous help in translations! It is an Internet based project, but most important in our concept are decentralised printouts, copied and distributed in the various migrants-localities and communities. "Crossing Borders" is an initiative of Frassanito-network and we plan to produce regularly issues at least every three or four months. But it depends also to your feedback and participation! So all of you are invited to support this newsletter, by contributions and distributions.